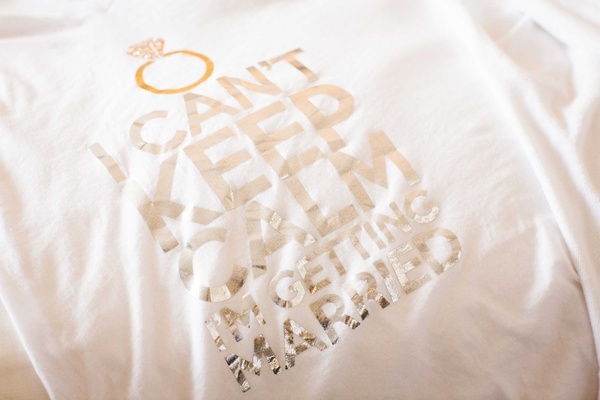 Before planning the ultimate surprise proposal, Chris asked for the blessings of Tia’s sister, father, and mother. 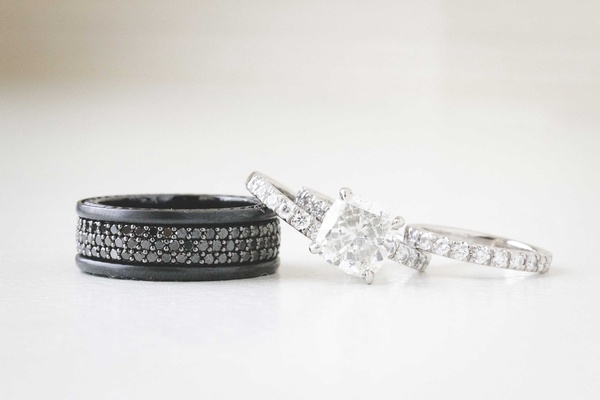 After “stalking” his beloved’s profile on a popular image-sharing website – “every woman has a wedding board!” he laughs – Chris hired a jeweler to design the perfect engagement ring. “I tried to spoil her as much as I could,” he adds. While on vacation together in Puerto Rico, Chris proposed on the beach at sunset. “I thought I had planned every detail of our trip, when all along, Christopher was crafting the most romantic proposal!” exclaims Tia. 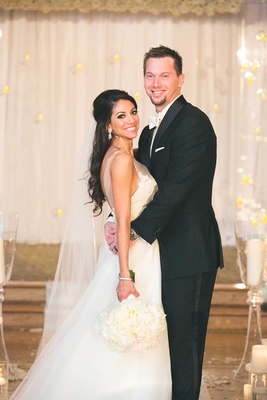 When selecting the site of their New Year’s Eve nuptials, the bride and groom decided upon a popular venue in Atlanta, Georgia, where Chris was playing professional baseball with the Atlanta Braves. 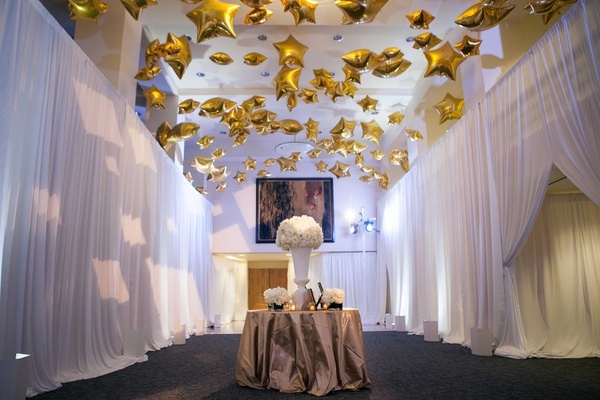 “We didn’t want to do a flip [of the room], and we didn’t want our guests to have to change locations on New Year’s Eve in traffic,” explains Tia of their decision to choose a site that offered two ballrooms at the same location. 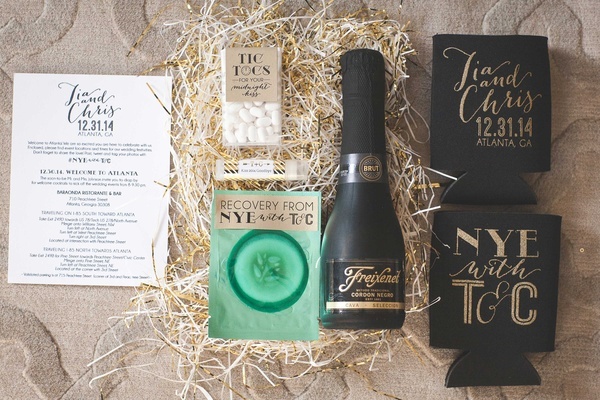 When attendees arrived, they received welcome boxes filled with items hinting at the festive party to come: personalized koozies, miniature cava bottles, lip balm with “Kiss 2014 Goodbye” labels, Tic Tacs to prepare for a “midnight kiss,” and cucumber pads for de-puffing eyes the next morning. 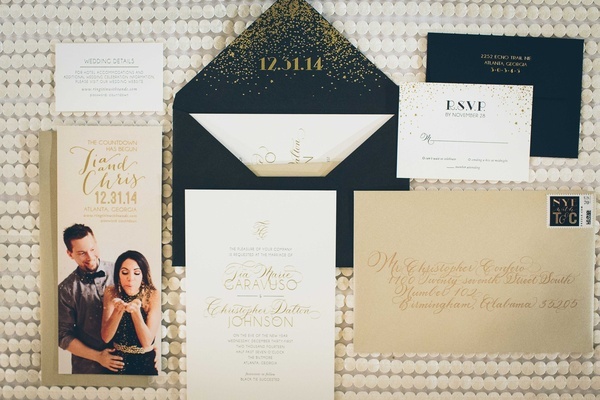 Desiring an evening ceremony that exuded love and romance, Tia and Chris’ sophisticated décor boasted a color palette of ivory and gold illuminated by soft candlelight. 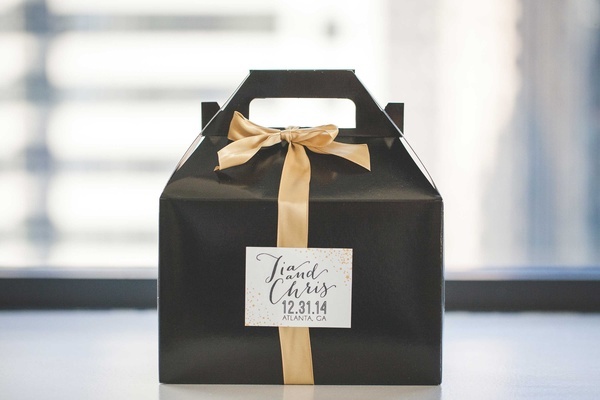 To set the tone for the fun-filled event, loved ones were also offered Champagne, mascarpone-filled strawberries, and handcrafted Norman Love® chocolates (as a nod to their hometown in Florida). 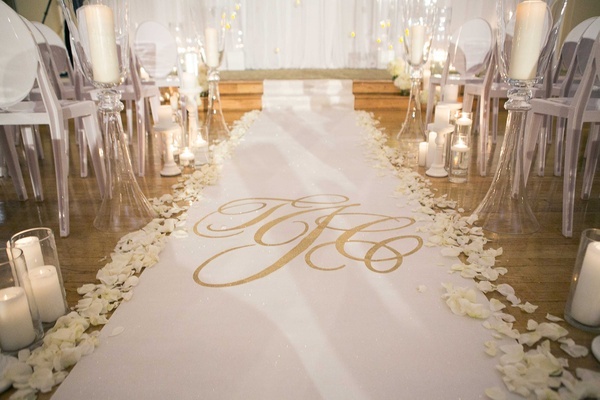 An all-white custom aisle runner embellished with the couple’s golden monogram was lined with alabaster rose petals and flickering candles placed inside glass vases or atop pearl pedestals. 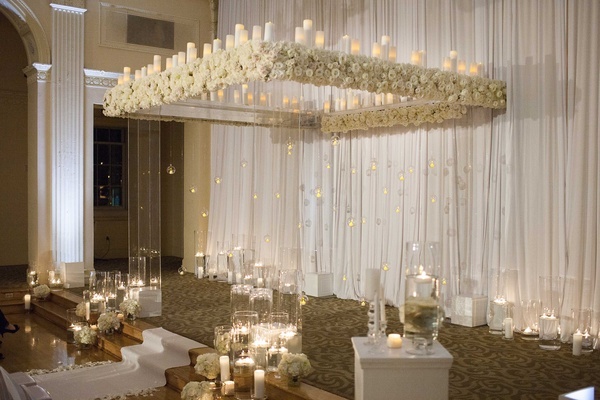 The candlelit aisleway led to a translucent four-post structure festooned with vanilla roses, pillar candles, and suspended glass orbs glimmering with tea lights; floating candles and bouquets of snowy flowers decorated the base of each post. 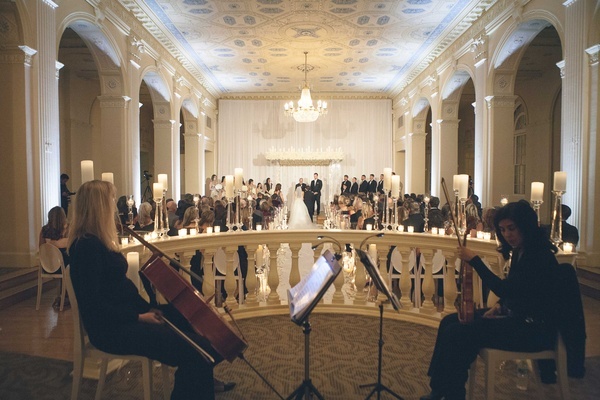 To the sounds of soft string music, bridesmaids walked down the aisle wearing floor-length gowns sparkling with gold sequins – save for the maid of honor who wore a formal ebony dress – and carried creamy nosegays comprised of ivory roses and ranunculus blossoms. 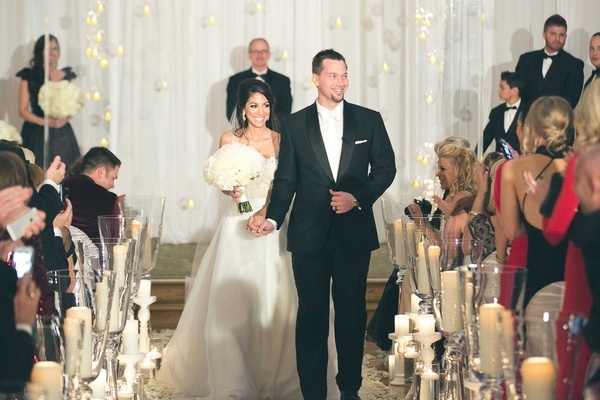 Tia entered the romantic space in an elegant bridal gown featuring a beautiful bodice bodysuit adorned with floral appliqués, illusion straps dotted with crystals, and an A-line overskirt. 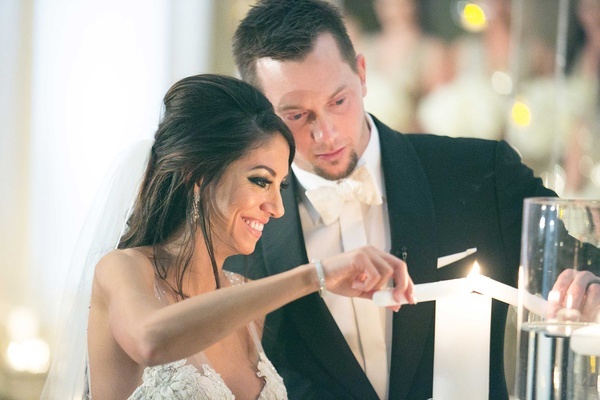 “I did not like the feel of having layered skirts, so Heidi Elnora was able to custom make a bodysuit that could be used with three skirts – one for the ceremony, one for the reception, and another for the after-midnight party,” the bride explains. 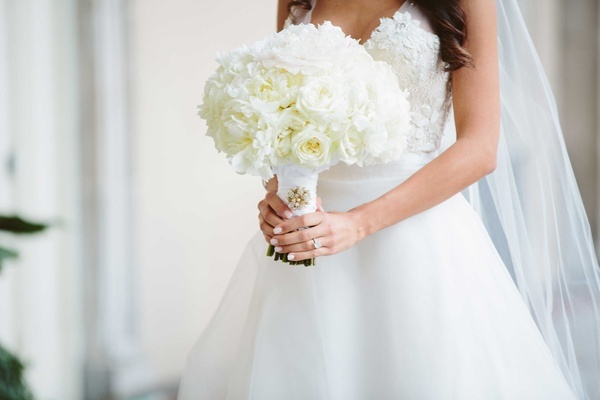 She carried a bouquet composed entirely of roses, ranunculus blossoms, and peonies in pearl, except for one pale pink peony in the center. 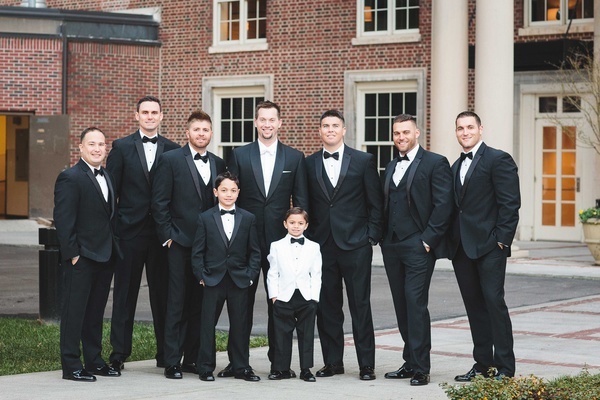 As their wedding designer performed a rendition of “I Won’t Let Go” by Rascal Flatts, Tia glided down the aisle to meet her groom, who, like his groomsmen, donned a black tuxedo. 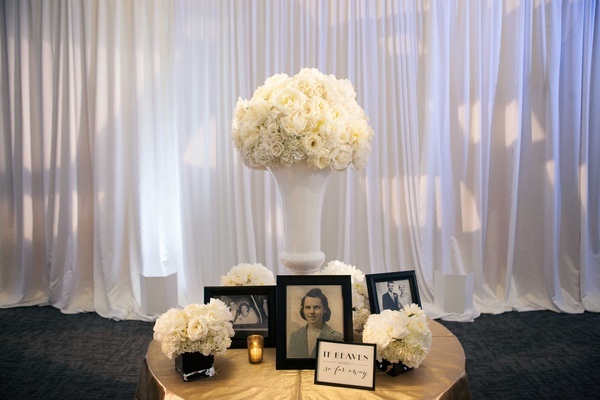 Following the heartfelt service, Tia and Chris experienced a special moment together in the reception ballroom before guests were invited to enter the space. 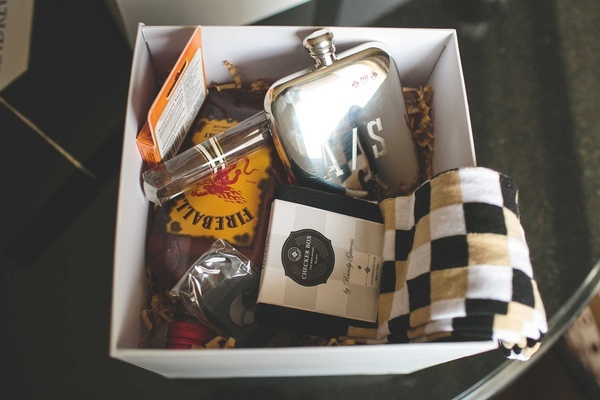 To the bride’s delight, Chris had planned a surprise for his beloved. The groom gifted Tia a heart-shaped locket by Tiffany & Co. filled with pictures of her grandparents. 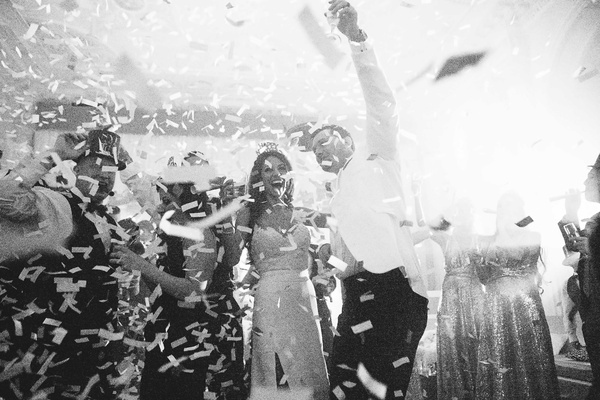 Then, her grandparents’ favorite song started to play, and the newlyweds shared a sentimental dance as husband and wife. “It was truly magical,” muses Tia. At 9PM, the festivities began. 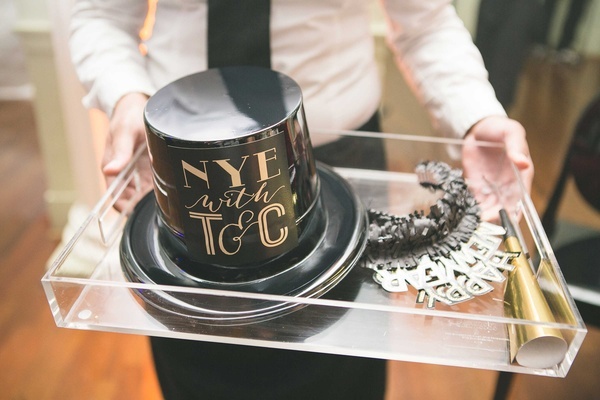 Since 200 of the couple’s friends and family joined them for their celebration on New Year’s Eve, “we wanted [the reception] to be an over-the-top party,” says Tia. 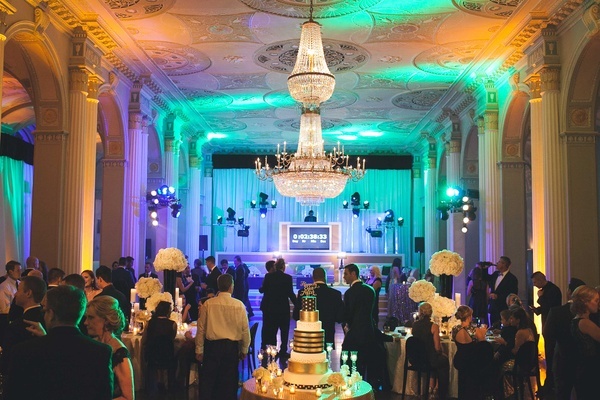 The space was set up to look like a club, with tray-passed heavy hors d’oeuvres and a sushi station in lieu of a formal sit-down dinner. 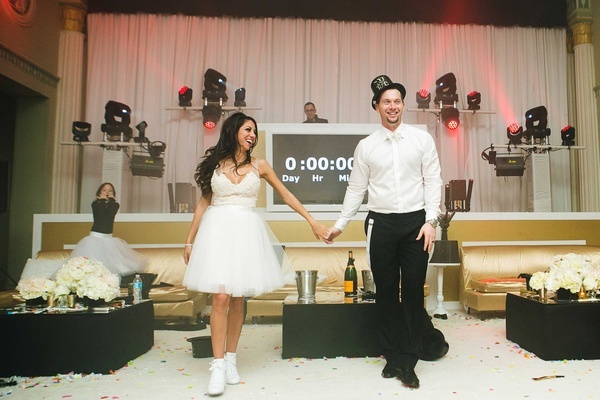 “We had a VIP area for the bridal party, an elevated platform for the DJ, lounge-style seating, and bottle service at midnight,” explains Chris. 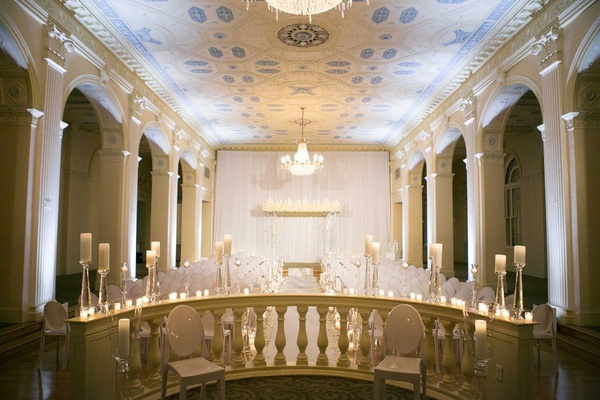 The ballroom was decorated with festive onyx, pearl, and gold elements. 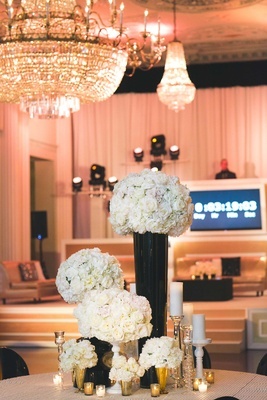 Round tables were draped with bullion sequin linens and featured magnificent alabaster floral arrangements in tall ebony vessels or gilt mercury-glass vases. 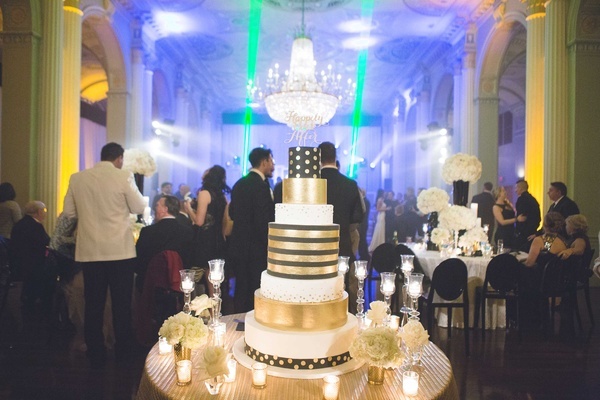 A seven-tiered confection designed by the bride and groom showcased layers of cake covered with black, white, and gold fondant embellished with stripes and confetti dots. 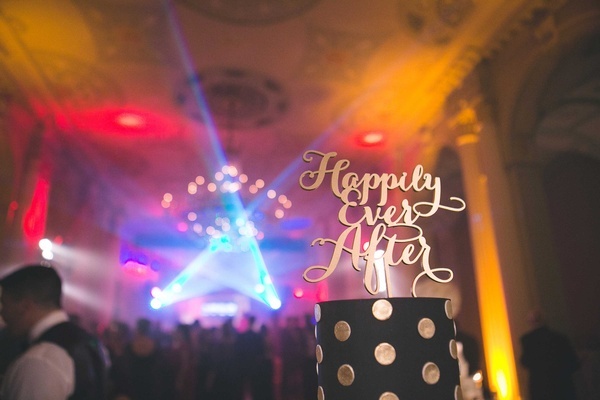 A “Happily Ever After” cake topper in modern calligraphy script completed the jubilant creation. 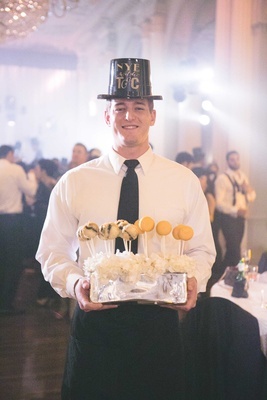 Following the cake cutting, servers in New Year’s Eve party hats passed additional sweets including deep-fried Oreo cookies, a variety of macarons, and candied bacon. 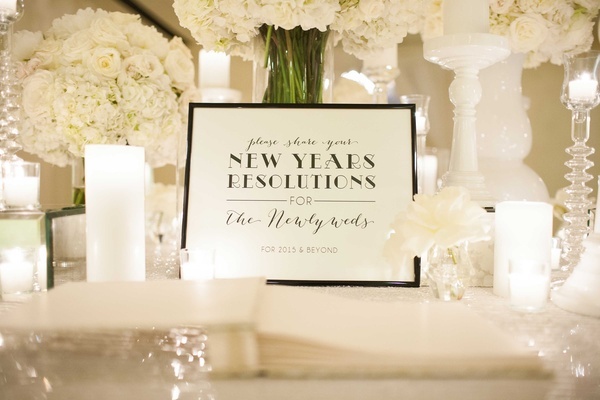 “Since it was a New Year’s Eve wedding, we hired a DJ known for his good mixes and for keeping the party going,” says Chris, who was overjoyed to ring in the New Year with his new bride, friends, and family. 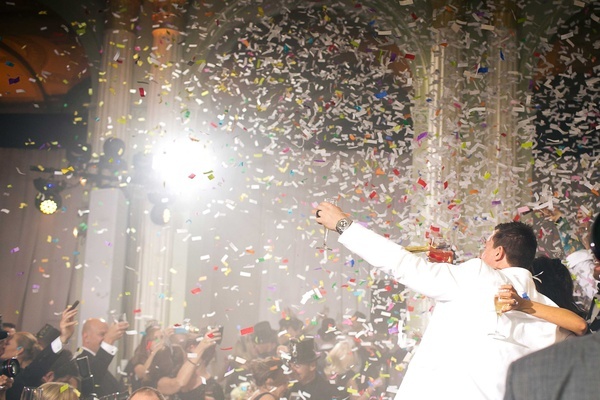 In the spirit of the holiday, confetti cannons exploded at midnight and the revelry continued until 2AM.